To some the most wonderful time of the year is Christmas, I mean they wrote a song about it being just that. And though I do love me some Christmas, nothing is better than October, my favorite month of the year. Hockey season officially starts. It is the one moment that no matter how good your team or bad(going through a “rebuilding” year) you have a small glimmer of hope that your team will win the Stanley Cup. For years, no one paid attention to my team, there were a lot of rebuilding years, but as of late they have come on strong. The slate is clean. The trades have been made and all you have is hope. Now some may scoff at the idea that I refer to the Calgary Flames as my team. No, I do not play for them, and no I do not work for them(though my wedding was blessed by them…I have it on paper). Many people pick on others when they say “we won or we lost” and so on. But without the fans, there would be no team. If no one comes to see the team or buys the merchandise than there is no money to have that team…so the Flames are my team. If you watch hockey or you play hockey you know what a superstitious sport it is(especially if you are a goalie). Each person(okay Canadian persons I know) has a quirk if their team is in the playoffs. I am no exception to this. Each year when my teams(hopefully) makes the playoffs whatever I am eating the first game they win is what I eat every game there after until they are out of the playoffs. One year I had to eat Kraft Dinner, another year macadamia nuts and sour licorice and last year was Split Pea Soup. Weird to outsiders of the game, not so weird to the die hard fans. So I say teams, which is really a lie(again with the lies). I have only one team, and one player. My player doesn’t play on my team so I must root for his team so that I can watch him play longer. Well that team, the Buffalo Sabres made it to the Eastern Conference finals with a couple game 7’s which meant I ate A LOT of soup. 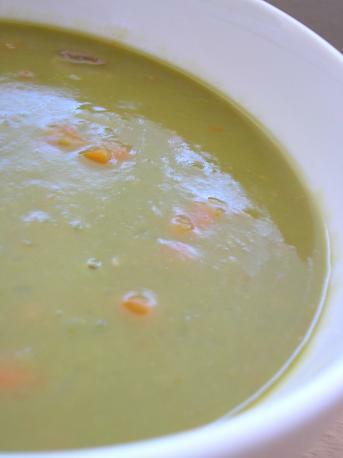 My poor husband dreaded coming home to the smell of pea soup and deep down I think he wanted them to lose so I would stop making and eating soup(he didn’t eat it, he wont eat soup). In hopes of bringing luck to my team/player the following season I always eat whatever I was eating during playoffs the year before. So out I dragged the soup pot and my husband raised his eyebrows for he knew what smell would soon be coming. It’s not a very exciting soup. I learned it from my mother who I am quite sure got it out of a Betty Crocker cookbook somewhere. I really do love this soup(yes, even after eating it about 20 times), especially with some homemade corn bread. The secret to making it really good it to get a nice and salty ham hock. I did not do this sadly as I am dieting(yuck) and stuck just some boring fat free ham in it….whatever you do….don’t do that. 1. Heat all the ingredients except the carrots(unless you like them really mushy like me…throw them in then) to boiling. Stir occasionally, reduce heat and cover and simmer for about 1 1/2 hours. 2. Remove your ham hock(let it cool) and strip the meat. Chop the bigger pieces into about 1/2 inch pieces. 3. Stir ham and carrots(if you didn’t add them in the begining) into the soup. Bring to a boil. Cover and simmer about another 30 minutes to an hour and a half depending on how thick you like your soup. 4. 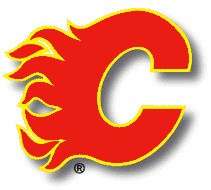 Cheer your favorite hockey team to victory…especially if it is the Flames!!! My favorite hockey player Daniel Briere…. co-captian of the Buffalo Sabres and one heck of a nice guy too! Okay. We seriously have to meet one day. Your devotion to hockey and the Flames is on par with my devotion to the Leafs! I especially had to laugh at your superstitions as I do the same. One year I got it into my head that if I read the paper at all, it would be bad luck for the Leafs. So I actually stopped reading the paper during the playoffs. Living in Calgary I am definately a huge Flames fan! If you are ever in town let me know, we can go to a game (I have connections!) By the way, whos your favorite Flame? Lisa- Mario is a good one to be a fan of! Joanne- almost everytime I visit my relatives it is during Stampede, though I was up there 2 years ago for the playoff run. My favorite Flame? SO hard to pick. I have a thing for goalies, so Kipper I love. 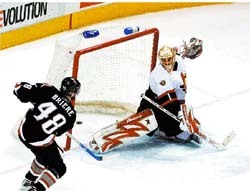 And of course, Jerome(even if he is not producing as much he still has great heart), I the addition of Dion, I’m a long time Warrener fan and I like Brad(local boy and he played for Phoenix when I was living down there). See I told you I could not pick. I liked reading this. There’s something about reading about ritual and deep devotion that is so fascinating to me. I tend not to follow sports (anytime I favour one side over the other, they lose, so it’s best that I remain oblivious). Ah, what a beautiful soup. You beat me, since I recently failed to make soup look interesting in photograph, whereas you have succeeded.